Updated news for 2019 which we believe relate to the end times and Bible prophecy. The news is full of Bible prophecy fulfilling events now, and there can be no doubt that we are living in the last days. Scroll down to see the news updates and you will see without doubt, taking into account the many endtime signs shown throughout this site, that we are living just before the second coming of Jesus Christ. MARK OF THE BEAST, SUN WORSHIP AND PUSH FOR SUN-DAY REST - India and France co-host first SOLAR alliance meet FOR CLIMATE, with PRAYERS TO THE 'SUN GOD'! Oh friends, please open your eyes and see what is going on here! This climate agenda is pushing the world to 'change the truth of God into a lie and worship the creation, rather than the Creator' (Romans 1:25). Notice how the literal creation week is being rejected and the Creator Himself is being rejected! ALL who get involved with this climate agenda are supporting that 'Mother of Harlots' in her drive to control the world and will be guilty of idolatry! Instead of uniting with Babylon, God's people must be doing all in their power to proclaim the THREE ANGELS MESSAGES and UPLIFT THE TRUE SEVENTH DAY SABBATH of our heavenly Father. WARNING: Satan is soon to manifest signs and wonders through the fallen churches and false religions. And all who do not have a love for the TRUTH will be deceived by the 'STRONG DELUSION' that is to come (2 Thess. 2:9-12). Are you ready? Will you be sealed? Please seek the truth and turn to Jesus Christ now, as the time of probation is soon to close! "I have come up with an even more striking concept, one that could have some potential impact if adopted by even a fraction of the population on the planet. Earth doesn't need an hour of rest a year. The planet needs a complete day of rest. A global holiday. A day where there is no energy except human energy being used ... I now believe that the 'Do Nothing Day' or as I like to now call it 'Planetary Holiday' should be celebrated on the first day of spring. Then we can expand it to the first day of summer as well. Hopefully this will be soon followed by the fall and winter seasons as people begin to realize the positive impact the holiday is having on the planet and the quality of our lives. We should then progress to once a month and eventually ... we will have a Planetary Day once a week, one as holy and important as Sundays used to be." Now this item is just from one man and his blog. So why post it? This is just an idea from one guy right? Wrong. This so called 'idea' is coming from many people and many places around the world now. The Salvation Army has suggested the 'most radical idea' to help the climate is 'to keep the Sabbath [Sunday]' (source). Author, Economist and Religious Scholar, Dr.David Smadja called for an INTERNATIONAL WEEKLY DAY OF REST to Combat 'climate change' (source). European Catholic Bishops have committed to securing Sunday as a day of rest in European law (source). There are various groups in America pushing for a Sunday law, and of course the Pope links Sunday rest with 'caring for the planet' in his climate encyclical. God has already set one day aside for rest and holy use and that is the 7th day Sabbath (our Saturday today). But Satan has deceived the world to turn away from God and in disobedience to God's clear command, uplift another day - SUNday, which has never been sanctified by God. Now the world is being deceived with this climate agenda and soon the cry will go around the world to keep Sunday as a day of rest to 'help the planet and society.' Then it will be enforced by law and will become the prophesied MARK OF THE BEAST. What the world needs now is the THREE ANGELS MESSAGES - God's last warning to mankind! "For years experts have been at odds about what exactly happens when we die, but recent research says that the brain continues to work after death, and we can be aware of everything going on around us, including knowing that we are dead ... We also study the human mind and consciousness in the context of death, to understand whether consciousness becomes annihilated or whether it continues after you've died for some period of time." This is a lie that Satan began right back in the garden of Eden. God told Adam and Eve concerning the tree of knowledge ... "thou shalt not eat of it: for in the day that thou eatest thereof thou shalt surely die." (Genesis 2:17). But Satan said to Eve ... "Ye shall not surely die." (Genesis 3:4). And that lie continues today, not just in the world, but right throughout the churches of Christendom. And Satan is going to use this 'immortal soul' deception in the last days to deceive the world. Please see the truth about this important subject so you will not be deceived - WHAT HAPPENS WHEN WE DIE? "The national chief imam, Sheikh Dr. Osmanu Nuhu Sharubutu has encouraged the rest of the world to emulate the unity between Muslims and Christians in Ghana ... He made the call when joined members of the Christ the King Catholic Church in Accra to worship ahead of his 100th birthday on Easter Sunday." With events like the recent attacks in Sri Lanka, in which 290 people died, this call for unity between churches and religions is going to grow stronger and stronger. And those of us who 'stand apart' for the Lord and His truth will be singled out as the ones 'causing division'. But we cannot go against the Word of God, which tells us to "come out from among them and be ye separate SAITH THE LORD." for "what concord hath Christ with Belial? .. And what agreement hath the temple of God with idols?" (2 Corinthians 6:14-18). While the world is calling us to unite, the Lord is calling - COME OUT OF HER MY PEOPLE! "Thanks to President Ronald Reagan and Pope John Paul II, the United States benefits from the Vatican's moral leadership. Thirty-five years ago today, William A. Wilson presented his credentials to Pope John Paul II, becoming America's first ambassador to the Holy See. This historic moment marked the start of formal diplomatic relations between the United States and the Vatican." Friends, you need to learn the truth of these two beast kingdoms of Revelation 13, and then you will be able to understand end time prophecy and what is to come upon the world. God told us of two kingdoms, represented as 'beasts' that would dominate the world in the end times. Those two kingdoms are America and the Papacy. Callista Gingrich, the United States Ambassador to the Holy See, and writer of this news article, states that "the United States benefits from the Vatican's moral leadership. That is exactly what God foretold in Revelation 13, whereby America would set up an 'image' to the Papacy (the first beast), and the Roman Catholic Church would end up being the 'moral voice' in America. Even though America was founded by the very people who were escaping the Roman Catholic Church and it's persecutions upon God's people in Europe hundreds of years ago. But Satan has lulled Americans to sleep and they now open their arms to embrace this enemy of true Christianity. Please see our pages AMERICA IN PROPHECY and the 7 HEADED BEAST OF REVELATION for the truth about these two end time beast kingdoms. "In the context of an increased attention to security concerns of European citizens, COMECE organised on Monday 8 April 2019 a first meeting between Military Bishops from across the European Union and EU military officials to enhance the cooperation towards a shared strategic culture across Europe ... In dialogue with General Claudio Graziano, Chairman of the EU Military Committee, EU Military Bishops highlighted the need for pursuing an integrated approach by better articulating military measures with civilian peace-building instruments promoting human, socio-economic and ecological development. As worldwide networks deeply rooted in local realities, religious actors can provide an important contribution in this regard." What you see here is the harlot of Revelation 17 riding the beast. A church state union with the church directing the affairs of the state. And what happened in times past when the state gave it's power to the Roman Catholic Church? Persecution! And that is what will happen again friends. When the 'kings of the earth give their power' to the Papal beast, then we will see what the Vatican REALLY stands for! This 'socio-economic and ecological development' is code word for the coming enforced mark of the beast, and the Roman Catholic Church is seeking the aid of the state to enforce her mark upon the world. Now some people say ... 'how can the Roman Catholic Church be the harlot AND the beast?' ... The beast of Revelation 17 is the same beast as we see in Revelation 13, and if you see our page THE SEVEN HEADED BEAST OF REVELATION you will see that it is Papal Rome. But how can the Papacy be both the beast AND the woman? The beast is not the Papacy alone, because the Papacy itself has no power to control the world. What the beast is, is a UNION of church and state, with the Papacy controlling the state. But what God has simply done in Revelation 17 is EXPAND on the picture of Revelation 13 to show us without doubt that it is an apostate church (harlot woman) in control of the state. And that harlot woman is the Roman Catholic Church. "Reverend Andrzej Choromanski represented the Pontifical Council for Promoting Christian Unity from 10-14 February 2019, in Kuala Lumpur, Malaysia, for the annual meeting of the Committee of the Global Christian Forum ... The GCF is a recent ecumenical initiative that emerged at the end of the last century within the context of the World Council of Churches ... the GCF intends to create an open space where representatives of the so-called 'historic churches' (Catholic, Orthodox and post-Reformation Protestant churches) and those identified as 'recent churches' (Pentecostal, Evangelical and Independent) are able to join together on an equal basis to foster mutual respect, to pray, to share faith stories, and to address together common challenges in the fast changing situation of global Christianity." If you go to the news item from the Vatican (click on the image) you will see Ganoune Diop (second from right on main picture), the SDA leader standing proudly with the ECUMENICAL team from various churches and faiths. And that is what the Global Christian Forum was created for - ecumenism - to foster unity and co-operation between the various churches with Rome - Babylon! SEE ALSO: Pope Francis says It is not our mission to convert people, but to live in brotherhood together! Recently, an SDA church in Texas was closed down for preaching the truth, and yet we have leaders involved in ecumenical relations with Babylon! It is clear that the General Conference has abandoned the three angels messages! And anyone who stands up for the truth, like Elijah, will be disfellowshipped or kicked out of the church. People all over the world are being disfellowshipped for standing up for the truth, while the leaders are uniting with Babylon and bringing Babylonian teachings into the church - our SDA pioneers would have been disfellowshipped by the current leaders! In fact, our pioneers probably wouldn't even be members of the current 'new organization' church. It's time to take a stand friends. What are you going to do? Keep supporting apostasy? Or stand with your brethren who give that trumpet a 'certain sound'? "How long halt ye between two opinions? if the Lord be God, follow him: but if Baal, then follow him." (1 Kings 18:21). We know the Lord is God, and we must take a stand for the TRUTH that is in Jesus Christ. Stop following the current leaders and denomination, and start following the Lord Jesus Christ. Let us return to the original faith of our church, and the truths God gave our pioneers. Great deception is upon us! Do not delay! "The world today is filled with the reality and repercussions of a changing climate. Glaciers are melting. Intense storms are strengthening. Seas are rising. Floods are spreading. Heat waves and droughts are prolonging. And the destruction and disruption all those events bring to people in all parts of the globe are increasing ... So far, science alone has not been able to provide the spark to overcome political inertia that has resisted such massive change. More and more, a prevailing belief is that a moral force is needed. Into that space, Pope Francis introduced nearly four years ago his landmark encyclical 'Laudato Si', on Care for Our Common Home ... and positioned the global Catholic Church as a prominent voice on climate change and environmental degradation that face populations across the planet." SEE ALSO: Bring back the Blue Laws! And who does the article say has fitted into that 'moral space'? The Pope! He is looked at as a 'moral leader' around the world, which is why the United Nations introduced their 2030 agenda just months after the pope's encyclical. Now what does Bible prophecy call the pope and the Papal Church of Rome? The 'beast' (first beast) of Revelation 13. And it is the 'mark' of this beast (the mark of the Papacy) that will be enforced upon the world. And what 'moral law' does the Papacy want enforced upon the world? The Sunday rest law, which this climate change agenda ultimately points to. We are living in incredible times friends. Prophecy is fulfilling and time is running out! Please don't delay any longer! Give your all and surrender your life to Jesus Christ, so that He can wash you and cleanse you with His precious blood which He gave on calvary. Please see the TRUTH about God's REAL 7th DAY SABBATH, so that you are not deceived by Rome's FALSE SUN-day sabbath. "A '60 Minutes' style Brazilian television show that reaches 56 million homes in dozens of Latin America nations has featured Capitol Ministries as its lead story saying the ministry is an example of 'how faith can have real results in the political world! ... Capitol Ministries is nonpartisan and that Ralph Drollinger, President and Founder, teaches the Bible to Democrats and Republicans in Washington, D.C. every week ... Through the broadcast, Brazilians learned about Capitol Ministries which will in May launch a discipleship Bible study ministry to members of the Congresso Nacional do Brasil, the legislative branch of Brazil's federal government ... The intention (of Capitol Ministries Bible studies) is to show these men and women a new way of leading their lives and their vocations as politicians so they could legislate with much more confidence ... The idea is to win the politicians' hearts with the teachings of the Bible and thereby help them to serve the nation better." What 'Bible teachings' are these politicians being taught? Sunday sacredness? The immortality of the soul? These are the kind of deceptions being taught in the majority of the fallen churches today, and the influence of ministries like Capitol Ministries is growing in political halls, influencing leaders with these false teachings. And as we know the image of the beast, a uniting of church and state, with the church directing the state, was to be created by America. With the desired goal of enforcing Rome's mark of the beast, the Sunday rest law, in honor of their false trinity god. The image of the beast HAS been created. It just needs 'power to speak and cause' the world to take the mark! "The International Monetary Fund's global reserve asset, the Special Drawing Right, is one of the most underused instruments of multilateral cooperation. Turning it into a true global currency would yield several benefits for the global economy and the international monetary system ... The anniversaries of the IMF and the SDR in 2019 are causes for celebration. But they also represent an ideal opportunity to transform the SDR into a true global currency that would strengthen the international monetary system. Policymakers should seize it." We are seeing massive movements now regarding the cashless society and some sort of 'global currency.' Why? Because God told us in Revelation 13 that the mark of the Papacy (first beast) is to be enforced upon all people, which will be the Sunday rest law. But what is needed for the Sunday rest law to be enforced and to stop anyone 'buying and selling' if they refuse to go along with it? A cashless society and a more unified 'global currency.' All these things are coming together friends, in fulfillment of Bible prophecy. Are you ready? Is Jesus your all and everything? Are you dying to self and sin and living in Christ? "President Trump is working on a plan for peace in the Middle East. And evangelical advisers like the Rev. Jentezen Franklin are getting the chance to weigh in on it. 'It's a very exciting time and a time truly when we need to be praying for the peace of Jerusalem,' said Franklin in a video he posted on Twitter after a White House meeting between prominent conservative evangelical Christians and Trump administration officials earlier this month. Franklin urged supporters to do all they can by praying and being vocal in support of Israel. 'The Bible says that we are to support Israel, we are to stand with Israel, and God will bless us,' Franklin said." This is an utter deception. We receive no special blessing in supporting Israel, as the Bible says we are now 'ALL ONE in Christ.' (Galatians 3:28). So there is no more blessing in supporting Israel than there is in supporting your next door neighbour! And who is the 'seed'? Paul told us in Galatians 3:16 that Jesus Christ is the seed. He is that 'promise' IN WHOM we become the children of God and a TRUE Israelite (Galatians 3:28). There is no distinction between any race now IN CHRIST. As we are 'all one' in Him. Praise God! But who IS ready to pour out "blessings" for supporting deception? Satan! And he is using this Israel deception as part of his final delusion in impersonating the second coming of Christ. Many Christians in the world today believe that Jesus is going to rule from Israel when He returns, and Satan will be able to use this deception as part of his impersonation of Christ. Many are going to fall for Satan's final delusion. The Evangelicals have fallen for Satan's lies and are uniting with the state in America to form the image of the beast. But there is something else that this so called 'Middle East peace plan' is going to do. It will stir up the king of the north and the radical Muslims to fulfil Daniel 11:45 in going to war with Israel to take Jerusalem as their own. And this will be the sign that probation is just about to close. It's time to BE READY in Christ. Please give your all to Him today! "The EU Council Presidency and European Parliament have reached an informal agreement on the introduction of mandatory biometric national identity cards including a photo and two fingerprints ... Cards will have to be made in a uniform ID-1 format, with a machine-readable zone, following ICAO minimum security standards, a contactless chip, and the issuing member state's country code." Climate change is being pushed as the main threat to humanity. The UN's 2030 agenda is being adopted around the world. The cashless society is slowly but surely being introduced. The churches and religions are being ushered together in this ecumenical movement, under the leadership of that man of sin in Rome. The cry of a 'new order' rings out around the world. And now we are moving towards mandatory biometric ID's. Does anyone else see these signs of where we are in history? Everything is falling into place for the enforcement of the mark of the beast. And NO! The mark is NOT a physical mark like an RFID chip. The mark of the beast is the mark of the Papal Church of Rome. And what does she want enforced around the world? Her SUN-day law! Please do not put your trust in man. We are COMPLETE IN CHRIST - Follow Him alone! "Maybe it's time to declare a national sabbath. Maybe it's time to step back from the scandalmongering and assess who we are right now." "In 1991, the Club of Rome, a group of 'elite' individuals (think tank for the Vatican? ), published a book called 'The First Global Revolution.' In that book, they admitted to inventing the climate change agenda as a 'common enemy' of mankind, in order to unite the world against this common enemy." Please see our full report on this - HERE. We are seeing another 'Tower of Babel' being set up, causing the world to turn from God and look to themselves in order to secure their own future. The world is being deceived into idol worship and the false Sunday sabbath (mark of the beast) of the Papacy is slowly but surely 'making its way in darkness.' And the people are unaware of what they are getting involved with. Please put your future in the Lord's hands, NOT man! Turn to the Lord Jesus Christ and put your trust in Him. "President Recep Tayyip Erdogan slammed Wednesday Israeli Prime Minister Benjamin Netanyahu for his remarks on social media targeting himself, saying that Turkey will resume its efforts to secure the rights of the Palestinian people and the status of Jerusalem ... 'We will continue our fight for the rights of Palestinians and the administration of Jerusalem in line with the weight it carries for the Muslim world until our last breath', he added." There is no doubt that Erdogan and Turkey are resurrecting that old Ottoman empire and they want Jerusalem as the capital of the Muslim 'Caliphate'. This was prophesied in Daniel 11:45 as the very sign that would signal the closing of the time of probation (Daniel 12:1). The 'king of the north' as Daniel 11:45 confirms, is to 'plant the tabernacles of his palace in between the seas and the glorious holy mountain.' This is pointing to Turkey and the radical Muslims taking control of Jerusalem and making it a 'seat' of authority for the Turks. So when we see this taking place, then we can know that the close of probation is about to happen and Jesus is about to return. Are you ready in Christ? Have you surrendered your all to Him, so that He can cleanse you and blot out your sins from the record books? Please don't delay! Please see our page DANIEL 11:45 AND THE KING OF THE NORTH for more on this. "The Lutheran World Federation (LWF) General Secretary, Rev. Dr Martin Junge addressed an international conference in the Vatican on Thursday, urging faith-based organizations to play a more incisive role in the implementation of the United Nations' Sustainable Development Goals. The LWF leader was among some 400 representatives of different faith communities taking part in the three-day conference on 'Religions and the SDGs: Listening to the cries of the earth and of the poor.' The 7-9 March event was organized by the Vatican Dicastery for Promoting Integral Human Development and the Pontifical Council for Interreligious Dialogue. In his presentation as part of an interfaith panel, Rev. Junge spoke about the UN Agenda for the year 2030 with its slogan 'Leave no one behind' ... This vision of ensuring that no one is left behind in the implementation of the development goals stands in stark contrast to the prevailing logic of exclusion." SEE ALSO: Adventist Leaders ORGANIZING Symposium with World Council of Churches and United Religions to push UN's SUSTAINABLE DEVELOPMENT 2030 Agenda! see also here. What we are seeing today is the fulfillment of Revelation 13, in which the world is being led to 'worship the beast' (Rev.13:3,12). That 'first beast' being the Papal Church of Rome. We are seeing a great 'gathering' of the apostate churches and religions uniting with the state and being controlled by that 'mother of harlots', the Roman Catholic Church. And in fulfillment of Revelation 17, the state will give it's power to Babylon, so that her dogmas can be enforced upon the world. And what one thing does the Catholic Church want the world to submit to? Her false Sunday sabbath rest. To hear church leaders like the Lutheran World Federation leader echoing the UN's slogan of 'leave no one behind' is very concerning, and we can see the connection between this 2030 agenda and the mark of the beast, which Revelation 13 says that 'ALL, both small and great, rich and poor, free and bond' are to 'receive a mark in their right hand, or in their foreheads.' - Or in other words - 'LEAVE NO ONE BEHIND.' It's coming friends. But don't settle down, thinking you have until 2030 to get ready. God is going to cut this thing 'short in righteousness.' GET READY NOW! Surrender ALL to Jesus and allow Him to make you ready. "New York City is careening closer to all-out financial bankruptcy for the first time since Mayor Abraham Beame ran the city more than 40 years ago, experts say. As tax-fleeced businesses and individuals flee en masse, and city public spending surges into the stratosphere, financial analysts say Gotham is perilously near total fiscal disaster." As we get nearer the return of our Lord, the cities are going to get worse and worse. Sin and suppression on every side! Cities are not the places God wants His children to live at any time, let alone the time when the mark of the beast is soon to be enforced and judgments are to fall. It's time to heed the warning friends. But if you see no way out, then take it to the Lord and allow Him to make a way for you and trust in His perfect will. It will not be easy for some to leave the cities. But we all have to make sacrifices for the Lord by faith. So take this to the Lord and go as He moves in your life. REMEMBER Lot and his family! "Pope Francis on Saturday met with the leadership of The Church of Jesus Christ of Latter-day Saints, the first-such meeting of its kind, on the eve of the dedication of the church's huge new temple in Rome. The Vatican offered no details of Francis' audience with the church president, Russell Nelson, and other leaders ... 'We have much in common', Nelson tweeted afterward. 'The differences in doctrine are real and they're important but they're not nearly as important as the things we have in common." Just look at this quote from a recent news article, where Adventist leaders in Croatia met with leaders from various churches and religions for this so called 'religious liberty' movement ... "One of the main ways in which the Association works,' explained Adventist Pastor Dragutin Matak, the General Secretary of the Association, 'is to bring together as many people as possible to share universal human values." ... The pope couldn't have said it any better himself! What about bringing the world to the only begotten Son of God, Jesus Christ, who is THE ONLY WAY to the Father (John 14:6)?? But what is the ultimate goal of this 'religious liberty' movement? To bring about UNITY with Babylon! Please don't be deceived by this movement friends. God is calling - COME OUT OF HER MY PEOPLE! "For months, school students in various countries have been protesting against the climate policies of their respective governments. In Australia, Belgium, France, Germany, Britain and more, they attend weekly rallies to call out politicians who, in the student's minds, are doing too little to combat climate change ... Every week, tens of thousands of teenagers and young adults skip class, mostly on Fridays their so-called 'Fridays for Future.' The protests are expected to hit even more countries on March 15, making it the biggest international school strike yet ... on March 15, American students are expected to join in the movement in a big way." Notice the call goes out to the PEOPLE of the world to make an image of the first beast, the first beast being the Papal Church of Rome. The Papacy is a unity of church and state, with the church telling the state what to do and history testifies that the Roman Catholic Church caused the state to FORCE her dogmas upon the world and persecuted anyone who would not bow to the dictates of the Papal Church. Revelation 13 tells us that it is the second beast - America, who 'gives life to the image of the beast' and 'causes the world to worship the first beast'. Church and state has already come together in America and we are seeing people rising up all around the world calling for change. So the conditions are ripe for the final movements to take place. And don't be fooled by Trump's apparent 'distance' from the Pope and the climate agenda. The Catholic Church already has it's grip upon America and is using the Evangelicals to do her bidding. This thing is in place and will not stop. Yes, there may be movements back and forth, with periods of apparent turning away, but just as God's Word is sure, this thing is sure and WILL happen. GET READY PEOPLE! THE FINAL EVENTS ARE UPON US! Give your ALL to Jesus Christ. And if you are not yet aware of the TRUE 7th day Sabbath, then please see our website - THE BIBLE SABBATH - "The truth shall set you free!" "India's raid into Pakistan was a calculated provocation, and if New Delhi isn't just playing to its home electorate, major world powers will be dragged into a war, a political analyst tells RT." The trouble in Venezuela is close to war. Tensions continue between America, China and Russia. Iran continues to threaten to destroy Israel. And now tensions rise between India and Pakistan. Amid all of this world tension, Turkey undertakes it's biggest naval military drill in its history! These are all signs that the battle of Armageddon is soon to be unleashed upon the world. The battle of Armageddon is to actually take place during the 6th plague. But there has to be a 'building up' to this BEFORE the plagues, and that is what we are seeing around the world today. The 'Eastern Question' is raising it's head again, which is another sign of the approaching battle. So what should our response be? GET READY! SURRENDER ALL TO JESUS! This is why God gives us prophecy, so that we can see what is happening and therefore wake up and be ready IN CHRIST. "UN Secretary General Antonio Guterres on Monday launched a new global strategy to combat hate speech, a growing scourge he said ... Hate is moving into the mainstream - in liberal democracies and authoritarian systems alike, he said in a speech at the opening of the council's 40th session." SEE ALSO: 2015 - Pope says freedom of expression has limits - if you speak against my 'mother' you can expect a PUNCH! Dear Mr Guterres, isn't sexually abusing children one of THE most 'HATEFUL' things you can do? Well Mr Guterres. Why are you not clamping down on that religious system FULL of pedophiles - the Roman Catholic Church? Is it because you are a Roman Catholic? Is it because the EU and many of the world's countries are controlled by Roman Catholics? There is a reason why we have seen 'hate speech' and 'extremism' by fanatics increase over recent years. It is part of the plan to bring in laws to BAN ANYTHING they deem as 'hate'. Especially Bible truth. It's that old Jesuit trick of 'order out of chaos' - cause chaos, and then bring about a 'solution' to that chaos. And this plan to tackle 'hate speech' is for the ultimate goal of banning Bible truth. Bible truth that exposes the pope as that man of sin. Bible truth that exposes the Roman Catholic Church as the whore of Babylon. Bible truth that exposes homosexuality as a sin (Romans 1:24-32). Bible truth that shows Jesus Christ is THE ONLY WAY to eternal life. And it is these truths and many more Bible truths which Satan wants to make appear as 'hate', and therefore BAN them. There is nothing new under the sun friends. Our forefathers were killed for holding onto and proclaiming the truth. The Bible says that 'the truth will set you free' (John 8:32), but the world does not want to be free in Christ. The world has given itself to Satan and hates God's Son, which is why the world will hate us to. So who are the ones showing true hate? Those who are against Christ and His truth. But fear not those things which the world will do to us, for the Lord is with us and will uphold us with His righteous right arm. Their plan will fail! We must speak the truth no matter what - But please do it in love! "5th Annual Symposium on the Role of Religion and Faith Based Organizations in International Affairs - The Fifth Annual Symposium on the Role of Religion and Faith-based Organizations in International Affairs will focus on financing for sustainable development and build on this vision of an economy of life as the flourishing of all life ... This event is organized by: The World Council of Churches, ACT Alliance, General Board of Church and Society of the United Methodist Church, General Conference of Seventh-Day Adventists, Islamic Relief USA, United Religions Initiative. Co-sponsored by: United Nations Inter-Agency Task Force on Religion and Sustainable Development." My Adventist brothers and sisters, it's time to wake up! The leaders are betraying you into the hands of the enemy! As we have reported a number of times over the past few years, this 'sustainable development' agenda is being used to transition the world to a new 'global economy' that is based upon the Vatican's 'green Sabbath' (Sunday law) goal. This agenda is seeking to control every aspect of our lives and to force everyone to be inclusive, no matter what our beliefs are, in fulfillment of prophecy. And SDA leaders are taking part in this! In 2017 we reported how the UN's Geospatial Organization, which tracks everything on earth, is linking up with this agenda TO FORCE Sustainable Development. We also reported in 2017 how the Vatican is mobilizing religious communities to act with solidarity to implement the sustainable development goals. And last year we reported on how Catholic leaders are pushing for a sustainable financial system on reflection of the pope's climate encyclical. Now what do you think all this is leading to? 'no buying and selling' unless you accept the mark of the beast (Revelation 13). And SDA General Conference leaders are taking part in this! "John Harvey Kellogg brought the 'Alpha' of deadly heresies into the Advent movement by 'spiritualizing away' the personality of God. The 'OMEGA' of deadly heresies came into the Advent movement by REPLACING the fundamental principles of the Advent movement concerning God, with BABYLON's CENTRAL DOCTRINE - the trinity. A doctrine that DESTROYS the pure gospel message!" The trinity doctrine was brought into the Adventist Church by the likes of LeRoy Froom and Co for one very simply reason - to bring the Seventh-day Adventist church more in line with the fallen churches of Babylon. This is a very serious issue friends, and is NOT a "distraction" from the three angels messages, like some Adventist preachers say. The first angels message deals directly with the God we worship. So how can this issue be a 'distraction'? The God we worship IS the three angels message! Can you get any more 'startling' than changing Gods? Are you going to fall for the Omega of apostasy like the majority of the church has? Please read the above post and heed the warning. "Rep. Ilhan Omar (D-Minn.) called on the next president to declare a national emergency on climate change "on day 1" after President Trump made the same declaration to appropriate funds for a border wall. Our next President should declare a National Emergency on day 1 to address the existential threat to all life on the planet posed by Climate Change." Are we seeing a game being played out here between Trump, the Republicans and the Democrats? Is the end goal of all of this 'border wall emergency' simply to bring about a national emergency declaration concerning climate change? We know that this climate change movement is based upon the pope's climate encyclical 'Laudato si'. And what does the Vatican want enforced around the world? Their SUNDAY LAW. Satan already tried FORCE during the dark ages, which didn't work. So now he is using STEALTH to enforce his false sabbath. And what better way to bring about a Sunday law, than to deceive the world into thinking that our biggest threat is the climate and we need to shut down once a week to help the planet and 'bring everyone together' in this ecumenical movement. Well, he has already brought together the majority of churches through his false trinity god. Now he just needs to unite the world on a 'common cause'. And what bigger 'common cause' can there be than to 'stop the destruction of the planet' by halting 'climate change'? The 2030 UN agenda is moving forward, to bring everyone in line with this 'sustainable development' goal. And there is no doubt that the Vatican is behind all of this, bringing their false sabbath into force by stealth! And all the while the churches are looking out for a microchip as being the mark of the beast. Wake up people! Satan is the master DECEIVER! The world AND the churches are being DECEIVED. "Lou Engle and key charismatic leaders believe that in 2019, God will ignite a movement in the next generation as never before. Specifically, these leaders believe Billy Graham's mantle of evangelism will be poured out on the next generation-and they have called for a gathering to usher it in. This event, called The Send, will take place Feb. 23 at Camping World Stadium in Orlando, Florida ... We believe that [Graham's] mantle is hovering, waiting for thousands to lay hold of it, Engle says ... They also prophesied that stadiums would be filled by these believers with signs and wonders ... On Feb. 12, 2018, Engle was on a trip, seeking God, when he read 2 Kings 2, in which Elisha actually receives the mantle of Elijah. Elisha basically says, I will not leave you, Elijah, until I get your spirit upon me. As Engle read those words, the Holy Spirit gripped him, and he wrote in big letters in his Bible, 'BILLY GRAHAM I WILL NOT LEAVE YOU UNTIL I GET A DOUBLE PORTION OF YOUR SPIRIT ON THE NEXT GENERATION!' ... Engle says. 'A great awakening is at hand!'" But what kind of 'revival' or 'awakening' is coming? Well, you only need to look at what these leaders believe to see that it will not be a true godly revival, but rather a false revival. Notice Engle said that 'Billy Graham's mantle is hovering, waiting for thousands to lay hold of it'? And he uses Elijah and Elisha as an example. But what is the difference between Elijah and Billy Graham? Elijah was taken to heaven ALIVE, but Billy Graham is SLEEPING [dead] in his grave. But due to the false teaching of the 'immortal soul' among the apostate churches, Satan is ready and waiting to GIVE THEM HIS SPIRIT, accompanied by 'signs and wonders' to make them think it is from God. Please see our website THE TRUTH ABOUT DEATH AND HELL for the truth on what happens at death. And what are these apostate Evangelical leaders seeking? UNITY with the Roman Catholic Church - please see our video - Billy Graham Death 'A SIGN'? - False Prophets, False Revival and a FALSE JESUS COMING!! Great deceptions are upon us! Satan, through apostate American Christianity is going to show 'great signs and wonders', evening 'causing fire to come down from heaven' to 'deceive if possible the very elect'. Please heed the warning friends. Do not follow man. Follow Jesus Christ alone. "The official logo of the Pope's visit was chosen from about 50 entries in a competition. An explanatory note accompanying the logo's release says that a cross and a crescent in the logo are symbols of Christianity and Islam which highlight the interreligious relations between Christians and Muslims." There were, as of 2015, 1.8 billion Muslims around the world and 2.3 billion 'Christians' [most of whom are Catholics] (link). So that is a combined force of over 4 billion people! So if this union between Christians and Muslims proceeds, we will be facing a 'voice' and power that is unmatched in the world, with that man of sin at it's head." But judgment is still to fall upon these apostate churches who unite with the world. Revelation tells us that there were 'three woes' to fall upon the world. The first two woes have past, BOTH being Muslims attacks against apostate Christianity. But the third woe is still to come. And with the first two woes being jugdments against apostate Christianity at the hands of the Muslims, it is likely that the third woe will be the same. Now while there are 1.8 billion Muslims around the world, it has been stated that there are about 100 million 'radical' Muslims who seek vengence against the West and Christianity. So as things develop among apostate Christianity, will God allow these radical Muslims to be unleashed as judgment, to fulfill the 'third woe'? Time will tell. While all these end time events show we are nearing the close of probation and soon return of our Lord, we must respond by dying to self, surrendering all to Christ and allowing Him to cleanse us from all sin, so that we may be clothed in His righteous garments and be ready for the wedding feast. Do not follow man, FOLLOW CHRIST. "Nancy Pelosi addressed a gathering of presidents of Christian colleges this week in Washington, where she thanked the evangelical community for its leadership on immigration and refugee policy reform. To this end, the speaker of the House quoted a favorite bit of biblical wisdom in her opening statement: "To minister to the needs of God's creation is an act of worship. To ignore those needs is to dishonor the God who made us." OK, actually, she said, it might not technically be from the Bible. "I can't find it in the Bible, but I quote it all the time," Pelosi said as she introduced the quote. "I keep reading and reading the Bible - I know it's there someplace. It's supposed to be in Isaiah. I heard a bishop say, 'To minister to the needs of God's creation." Quick note! - Nancy Pelosi "thanked the evangelical community for its leadership on immigration and refugee policy reform." - That is the image of the beast - a uniting of church and state, with the church LEADING the state and defining it's policies! So Nancy Pelosi heard a Catholic bishop say something, and even though it is not in the Bible, she just trusts the Catholic bishop and quotes it herself all the time! Does this sound like the world today? It sure does! Instead of following a 'thus saith the LORD', the world follows man! And this warning is all centered upon the third angel's message. A warning not to follow man and his traditions and end up receiving the mark of the beast. The third angel's message is a loving warning for us to follow Christ alone (Rev.14:1-5) and receive His righteousness. This is exactly what is happening today. The 'women', the churches of the world, are coming together in this ecumenical movement, naming the name of Christ, but are saying ... "we will do things OUR OWN way, just let us be called by thy name.". This is Babylon and her daughters who God is calling His people OUT FROM (Revelation 18:4). And what will happen if we choose our own way over God's will? God will 'give us over to our reprobate mind' (Romans 1:28), and death will be the outcome. "The Document on Human Fraternity for World Peace and Living Together signed on Monday afternoon in Abu Dhabi by Pope Francis and the Grand Imama of Al-Azhar, Ahmad el-Tayeb, is not only a milestone in relations between Christianity and Islam but also represents a message with a strong impact on the international scene ... The document opens with a series of invocations: the Pope and the Grand Imam speak 'in the name of God' ... Al-Azhar, together with the Catholic Church, declare the adoption of a culture of dialogue as the path; mutual cooperation as the code of conduct ... In the document, 'we ..call upon ourselves, upon the leaders of the world as well as the architects of international policy and world economy, to work strenuously to spread the culture of tolerance and of living together in peace ... bring an end to wars, conflicts, environmental decay and the moral and cultural decline that the world is presently experiencing." First of all. Can the pope and Imam 'speak in the name of God'? Well, they can speak in the name of 'a god', but NOT the God of the Bible. Not the one true God who created the universe. Why? Because they both reject the one true God of the Bible, in favor of false gods. So I ask, how can we 'work together' with the Roman Catholic Church, Muslims and any other false religion and apostate church, when they reject the one true God and His Son and teach all sorts of false teachings? How can we have 'dialogue' [code word for UNITY] and 'mutual cooperation' with an institution that GOD CALLS BABYLON and WARNS HIS PEOPLE TO COME OUT OF HER? It's not possible. We do not condone violence. We do not condone hate. We simply share the truth of God's Word in the LOVE OF JESUS. But this is not good enough for the Roman Catholic Church, because the Word of God - THE TRUTH - exposes her as that 'mother of harlots', and antichrist system. God's Word exposes ALL false religions, which is why they are all working to UNITE and to STOP THE TRUTH. Satan is the one driving this ecumenical movement to unite the world 'for peace'. But what did God say would happen when they 'declare peace and safety'? 'SUDDEN DESTRUCTION' (1 Thess.5:3). Satan is very clever, and has caused much of this 'moral decline' in the world, so as to bring about a 'moral leader' to turn things around. But that so called 'moral leader' (the man of sin) will not be working for God, but for Satan and will deceive the world into taking the mark of the beast. Great deceptions and 'deadly delusions' are right before us friends! Please follow Jesus Christ, the Son of God ALONE. Do not let the leaders and fallen churches deceive you. Do not follow man. Follow Christ. "A private space company has launched the largest fleet of satellites into space in 'human history'. Planet Lab, founded by ex-NASA scientists, claim they have launched 146 small satellites by rocket into space and have manufactured a total of roughly 300 so far. The satellites combine to photograph the entirety of Earth's landmass for use by intelligence agencies, agricultural companies and humanitarian purposes." 'BIG BROTHER' is growing! We knew from Revelation 13 that for America (the second beast) to be able to cause the world to take the mark of the beast, there needed to be some sort of global monitoring, to keep a check on people. Well, that is now in place. So we can see all the needed systems being put in place ready for the enforcement of the mark. Cashless societies are being set up. The world's churches and religions are uniting in this ecumenical drive. Satan is bringing about a mindset in the world, due to all the 'terrorist' attacks, to bring about unity and reject truth. The pope, that man of sin is being lifted up as the world's 'moral leader'. And a global system of spying on us wherever we are is being put in place. So the world is almost ready for the mark of the beast to be enforced. BUT GOD'S PEOPLE ARE NOT READY! Which is why we are still waiting, over 100 years on from the time of our Advent pioneers. If we continue to reject the promptings of the Holy Spirit and spurn the opportunity to get ready now, then God will pass us by and leave us in our sins. Yes, God is patient, and loves us so much and wants us to be saved, but if we continually keep putting off getting ready, by surrendering ALL to Christ, then the time will come when it will be TOO LATE. So please do not put it off any longer. Time IS running out. Give your all to Jesus today, and then there will be nothing to fear from what is coming upon the world. "Walton, who was named the president of the Adventist Health Policy Association last summer. In his new role at AHPA, an affiliation of five Seventh-day Adventist healthcare systems, he is building up the first Washington policy shop ... Walton expects to spend more of his time at meetings on Capitol Hill, pushing for policy and advocacy priorities with chiefs of staff, legislative directors and legislative aides, he said ... For instance, they are supportive of recent opioid legislation which put resources toward prevention and treatment which passed Congress last fall. Beyond that: '340B, the drug discount program, does a lot to fund our community needs' ... The AHPA hopes to be more connected and accessible to lawmakers and to partner with like-minded organizations like the Catholic Health Assocaition, Ascension Health and the Healthcare Leadership Council. 'Those are all groups that function out of D.C., are headquartered out of D.C., have relationships in D.C."
Oh my Adventist brothers and sisters. This is not to condemn, but to WARN and WAKE UP our people! The leaders of the Seventh-day Adventist Church have betrayed us into the hands of the enemy! And yet the vast majority of Adventists today cannot see what has happened to the church. Yes, God started this church with our pioneers to take the final message of the gospel to the world. But wolves have entered in and we have now allowed Satan to take control of the denomination. When our pioneers needed strength and power, they did not look to the state for it, they got on their knees and sought God ALONE for it. But today, the SDA denomination is repeating the same sins of Israel of old. Turning to "Egypt" for help, rather than the Lord. And as a result of turning away from God, IF they don't repent, they will NOT be able to enter the promised land! Oh please wake up dear brethren! It is time to follow the Lord Jesus Christ and Him alone, just as Revelation 14:4 tells us to. Then we will be sealed with the Father's name in our foreheads. The denomination cannot save you. Jesus Christ, the Son of God ALONE can save us - Please see our page COMPLETE IN CHRIST. SDA leaders are now promoting ecumenism with Rome. The church has turned away from the truths God gave our pioneers. SDA hospitals have turned away from the original health plan and now embrace Babylon's 'sorceries' [DRUGS]. God has been removed and the church is now seeking power from Rome! Lord have mercy! "The shocked response has been rolling in across the nation after Democrat lawmakers in the state of New York did the unthinkable Tuesday, legalizing the abortion of unborn babies all the way up until the point of birth. The response on CBNNews.com has been stunning as more than a million readers simply can't fathom why any state would allow viable babies to be killed ... The stunning developments out of New York appear to be galvanizing the pro-life movement to fight abortion with renewed fervor." Do you see how clever Satan is working in these last days? He is playing the one side off against the other, and yet is controlling BOTH sides! Now just to make it clear, we are against abortion. But Satan is the arch deceiver and He is bringing about conditions to cause the churches to rise up, UNITE, and take control of things, to enforce "morality". Obama played such a hand during his term in office, legalizing immorality, that the Evangelicals got so fed up that they rose up and united to get 'their man' in office. Someone who they could 'control' and 'combat the immorality.' And now things like the LGBT agenda and abortion are causing the Evangelicals to unite even more to gain control and enforce morality. And what will eventually be enforced as a 'moral' law? Especially with the climage change agenda being pushed so much? The Sunday law, which will be the mark of the beast. Some of the things that these Evangelicals are seeking, appear to be good and right things. But it will merely draw people into the final deception of Satan. The image of the beast, a church-state union, has already been created in America. Now Satan is making things happen to give 'POWER' to the image of the beast, so that it can 'cause and speak', to enforce the mark! We have no business seeking union with the government. We are merely to be a light to the world, without having that union with the world. Those who have ears to hear and eyes to see - LOOK AND LISTEN! Two things here. One - this shows what we have been saying a long time, that this so called 'religious liberty' movement is fake and is basically a code word today for ECUMENISM! And what did the pope say? Ecumenism is NOT optional! Wow! So all the churches coming together in this 'religious liberty' movement, including the current Seventh-day Adventist Church, are uniting in ecumenism and will end up saying, 'if you join with us, you will enjoy religious liberty, but if you don't join with us and speak out against us, you will NOT enjoy liberty.' And thus persecution will come from the churches who have united with the mother of harlots, against God's elect who refuse to bow their knee to Baal. But fear not, the Lord is with us who remain faithful! What did Jesus pray for? That we be united in the trinity? NO! He prayed that we be united in God the Father and His Son. Yet the churches have rejected the truth of the one true God and His Son, and replaced the one true God with a false god of Rome - the trinity! So how can we unite with churches who worship a false god? We can't. We can only unite in the one true God and His Son. "In a desert tent guarded by armed police and a thick-set bouncer, Laxmi Narayan Tripathi is blessing a constant stream of pilgrims, who garland her with marigolds and kneel to touch her feet. Tripathi, a tattooed transgender leader and a former reality TV star, has become an unlikely icon at India's Kumbh Mela, a huge religious festival being held on the banks of the Ganges river in the city of Prayagraj. Up to 150 million people are expected to attend by the time the festival ends in March." The nations are stirring for that final battle which God's Word prophesied would happen in the last days - the Battle of Armageddon. Daniel 9:26 said that 'desolations are determined' upon Israel unto the end, due to their rejection of the Son of God. Jesus also prophesied that 'when you see Jerusalem surrounded by armies, know that her desolation is near' (Luke 21:20). This was fulfilled in AD70 when Jerusalem was destroyed by Rome, but it has another fulfillment in the end times. More judgment and desolation is coming to Israel and the prophecy of Daniel 11:45 points to that final fulfillment, when the king of the north (Turkey and the Muslims) 'plant the tabernacle of his palace in between the seas and the glorious holy mountain'. So will this escalating war between Israel, Iran and Syria pave the way for Turkey and the Muslims to make their move in capturing Jerusalem? Time will tell. One thing is for certain though - the signs show us that probation is soon to close! And Jesus is soon to return! So are you ready in Christ? Have you surrendered ALL to Him? "In setting out the Trump administration's Middle East policy, one of the first things Mike Pompeo made clear to his audience in Cairo is that he had come to the region as 'as an evangelical Christian.' ... Vice President Mike Pence and Pompeo both cite evangelical theology as a powerful motivating force ... For many US evangelical Christians, one of the key preconditions for such a moment [the second coming] is the gathering of the world's Jews in a greater Israel between the Mediterranean and the Jordan River. It is a belief, known as premillenial dispensationalism or Christian Zionism - and it has very real potential consequences for US foreign policy ... The influence of evangelical Christianity is likely to become an important question as Trump finds himself dependent on them for political survival." SEE ALSO: The Evangelical Force Behind Trump's Jerusalem Move, and their Desire to Bring on Armageddon! Evangelicals know very well that the moves they are making in Israel will stir up the Muslim nations. But they do not care about that. They know that the Muslims are going to retaliate against their moves there. But because the Evangelicals [wrongly] believe God is still behind Israel and them, then they think God will fight for them and by ushering in the battle of armageddon, they believe Jesus will return to help them defeat their enemies - namely Islam, and then they think that Jesus will rule from Israel for 1000 years. Problem is, it will be Satan whom the Evangelicals and Jews accept as the 'coming messiah'. Then 'signs and wonders' will be performed by the devil, to deceive the world into following this Evangelical image of the beast, as Revelation 13 reveals, with Sunday laws [mark of the beast] in honor of that man of sin, the pope and Papal Church of Rome to follow. It is all building up just as God stated through prophecy! And we MUST BE READY. Friends, it will soon be too late to GET ready. We must BE ready. So please, heed the signs and warnings that God is giving us, and surrender your ALL to Christ, so that you can be ready in Him. "Germany's defense minister has revealed a controversial European joint army is 'already taking shape' - thanks to her French allies. Germany and France are now the 'driving forces' in European defense and they would stand together in the face of any land assault, said Ursula von der Leyen. The politician also hit back at those who criticize the European Union's PESCO defense scheme - where national military leaders pledge to co-operate with each other. PESCO - which stands for Permanent Structured Cooperation - involves 25 armies working alongside each other." Yet more Bible prophecy coming to pass. We were told in Daniel 2 that the Roman Empire would split and become a 'broken' kingdom (Europe), which is exactly what happened, and that as a kingdom, it would remain 'partly broken', but the 'strength' of Rome would remain in it. That 'strength' remained to give the pope(s) and Roman Catholic Church power for over 1000 years, during which time the Papal Church had millions of Christians killed for simply wanting to follow God's Word, instead of the pope. Now we are seeing that 'strength' again, as Europe builds this army. And who will they give the power to? Revelation 17 told us that they will give their power to the 'whore of Babylon' - the Roman Catholic Church. And once again, the pope, that man of sin will have power over the nations, and along with America, the second beast of Revelation 13, will enforce the mark of the beast upon the world. There has never been a time in my lifetime, where reading the news was like reading from the prophecies of Daniel and Revelation - until today! We are seeing end time prophecy truly unfolding before our eyes, soon to see the return of our Lord Jesus Christ. And all these signs and movements that are occuring today should WAKE US UP to the reality that probation is soon to close, sending us into the arms of Jesus Christ and surrendering ALL to Him, so He can save us. Revelation 13 says that an image of the beast would be set up in America. That image is the image of the Papal Church of Rome, a church-state union, with the church LEGISLATING it's 'religious' dogmas upon the world. And this is what we are seeing today in America. The Evangelical and Catholic leaders have infiltrated the legislative halls of America and are slowly but surely legislating religion - soon to bring about the Sunday rest law in fulfillment of the prophesied mark of the beast. But don't be deceived by the 'religious freedom' tone that they are proclaiming in all this. This is merely a means to an end. And the only people who will enjoy 'religious freedom' will be those who jump onto the ecumenical bandwagon, and join with Babylon! PLEASE DON'T UNITE WITH BABYLON - YOU ARE COMPLETE IN CHRIST - FOLLOW HIM ALONE! "Now, well, the good news is... he actually did shut down the government, but don't worry, he'll fold in the end. The one person who deserves the most credit of all for going ballastic when Trump caved on wall funding right before Christmas, which I think we got him to take back, is Matt Drudge." There has been a movement for some years now in the Evangelical circle to gain control of government and be able to influence the government on it's policies. Today we are now seeing that movement fulfilling it's goal. The uniting of church and state, with the church dictating to the state is nothing new. The Roman Catholic Church controlled the states of the world for hundreds of years back in the dark ages. And just as Revelation 13 prophesied, an IMAGE to the Roman Catholic Papacy would be created in America - the image of the beast. Friends, we are seeing end time prophecy being fulfilled before our very eyes. Roman Catholics and Evangelicals have united and have taken control of government, to create the image of the beast - a church state union, with the church directing the state. And one day soon, as Revelation 13 confirms, the world will be 'caused' to bow down to the 'authority' of the image and to receive the mark of the beast, which will be the Sunday law, in honor of the false trinity god of Rome. Are you still part of these fallen churches of Babylon who are 'riding the beast'? (Rev. 17). If so, God is calling you OUT (Rev.18:4) - please HEED His call today. "In a speech to the Turkey Youth Foundation in Istanbul, Saturday, Erdogan affirmed his county's support for the Palestinians ... He said that 'as Muslims, we deal with people directly, and if there are people who are brave enough to provoke us, we will teach them a lesson.' ... A number of Turkish journalists tweeted that some in the crowd called out for Erdogan to bring about the Muslim reconquest of Jerusalem. Erdogan replied, 'Soon, God willing.'" Erdogan is seeking to resurrect the Ottoman empire and take back control of Jerusalem, which he sees as belonging to Muslims, not the Jews. And Daniel 11:45, the very last verse that is to be fulfilled in Daniel 11, before the close of probation (Daniel 12:1) sees the Turks as doing just that, planting the tabernacles of his palace in between the seas and the glorious holy mountain." - which is Jerusalem. Please see our page DANIEL 11 AND THE KING OF THE NORTH for a study on this. This prophecy is to do a specific job, and that is to tell us that the close of probation is soon to take place. Which means our lives are being judged right now! So are you living according to the faith you proclaim? Have you really surrendered all to Jesus and allowing Him to live HIS LIFE in you (Galatians 2:20)? Time is running out. TODAY is the day of salvation. Do not put it off. "The first batch of results from last week's election in the Democratic Republic of the Congo was finally expected Sunday, according to the country's electoral commission. But yet another delay in the violence-plagued election now threatens to throw the Central African nation into political turmoil - thanks to the meddling of the Catholic Church. At a press briefing on Friday, the country's influential Catholic Church held a press briefing and announced that it knew who had won the elections - but would not state who." Please open your eyes people. God has shown us in Revelation 17 that the end time antichrist system is an apostate church controlling the state, depicted by the harlot woman riding the beast in Revelation 17. Now what church has control over the state in countries around the world? There is only one! The Roman Catholic Church. The Catholic Church influences governments all around the world. She is that WHORE OF BABYLON who has committed fornication with the kings of the earth, and God is calling His people OUT of this apostate church (Revelation 18:1-4). But Babylon does not just comprise of the Roman Catholic Church, as the majority of Protestant churches have also become apostate, uniting with the state and have created an IMAGE to the Roman Church, just as Revelation 13 prophesied. And we see the perfect example of this in America, where the Evangelical leaders, alongside Roman Catholic leaders, are now influencing the American government. So God's people need to come out of all these fallen churches, as judgment is soon to fall upon them from God. So we have a choice to make - continue following the churches and the apostate leaders, and receive of the final plagues of God's wrath, or follow Jesus Christ alone and be saved. This is the message of the three angels of Revelation 14. "Incoming New York Rep. Alexandria Ocasio-Cortez brings with her a massive online following, influence she says she'll deploy only in support of candidates and politicians who support her plan for a 'Green New Deal.' ... The proposed rule change for the upcoming 116th Congress would require the creation of a 'Select Committee for a Green Deal' that would be responsible for creating the plan by January 1, 2020, with corresponding draft legislation soon after. Its scope and mandate for legislative authority amounts to a radical grant of power to Washington over Americans' lives, homes, businesses, travel, banking, and more." We need to wake up friends! Do you think that the government is just going to come out and say ... "this is the mark of the beast, you must take it or else!!"? Of course not! Satan moves by stealth and deception! And all of this climate, green agenda, is nothing more than a cloak for the mark of the beast. Did you notice the 'new deal' this Alexandria Cortez is pushing for, will end up controlling every aspect of our lives - including our finances? And what does Revelation 13 say? "And that no man might buy or sell, save he that had the mark, or the name of the beast, or the number of his name." (Rev.13:17). "Capitalism as we know it is over. So suggests a new report commissioned by a group of scientists appointed by the UN secretary general. The main reason? We're transitioning rapidly to a radically different global economy, due to our increasingly unsustainable exploitation of the planet's environmental resources and the shift to less efficient energy sources." [I have warned for years that the UN intends to deep-six Capitalism in favor of Sustainable Development, aka Technocracy. Now, the UN is coming out in the open as the global economy turns downward. Cries that 'Capitalism is dead' will soon be heard while Technocracy will be offered as the only possible solution to save the world. - TN Editor]"
The pope and the Vatican are no doubt driving this agenda. On many occassions the pope has spoken out against Capitalism, in favor of the Vatican's 'socialism'. There is an agenda afoot, and that agenda is the enforcement of the mark of the beast. 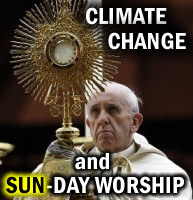 The Vatican and UN are using this climate change agenda to push their 'Green Sabbath' [SUN-day]. But having a capitalist society does not fit with this mark of the beast agenda, whereby they plan to shut down businesses every Sunday and force everyone to observe their 'Green Sabbath' for the 'sake of the planet', stopping people from 'buying and selling' if they don't go along with it. No. They need to shift away from Capitalism into another form of society. And that is exactly what we see happening today. Slowly but surely, the groundwork is being laid for the final deception. The world is in a state of flux and more and more people are calling for CHANGE! Satan is laying the final framework for his master deception. And yet the people of God are SLEEPING! It's time to wake up, for the day of judgment is at hand - the judgment that 'begins at the house of God' - are you ready? Have you surrendered all to Jesus Christ? "The United States and the Holy See share one of the most consequential diplomatic relationships in the world today. Our partnership, built on a strong foundation of trust and mutual respect, has advanced peace, prosperity and freedom. Over the last year, the U.S. Embassy to the Holy See has worked closely with the Vatican on a number of critical global issues, including religious freedom and human trafficking ... Other areas include the support of interfaith dialogue ... When President Ronald Reagan and St. John Paul II established diplomatic relations nearly 35 years ago, they understood that together, the United States and the Vatican would act as a worldwide force for good." These are the two beast kingdoms of Revelation 13 right before our eyes! The Papacy is that 7 headed beast, the first beast of Revelation 13. And America is that 'lamb like' beast, the second beast of Revelation 13. And God told us that these two kingdoms would come together to enforce the mark of the beast. The Papacy had it's day back in the dark ages, where it forced the world to bow in subjection to it's dogmas. And now in the end times, America will be the kingdom to enforce the decrees of the Papacy upon the world - the coming Sunday law being one of them, in honour of their false trinity god, which all the churches now bow to. "Two recent reports from the United States strongly suggest the United States is planning a major war with Russia and China ... The first report ... acknowledges that changes 'at home and abroad are diminishing US military advantages,' and that this diminution of these 'advantages' poses a threat to 'vital United States interests ... Acknowledgements of technological deficiency and strategic disadvantage do not sit comfortably with the image of an all-powerful America willing and able to defeat any threat to its own global interests or those of its allies. The latter prefer the comfortable delusion of an omnipotent US 'umbrella' ... History demonstrates that it is unwise to underestimate the extent to which the United States will go to maintain its self appointed role is the world's dominant hegemon." We have entered into new forms of 'war' these days, from technological wars to economical wars. So the 'war' that America is planning may not necessarily be a physical war with physical weapons. But one thing is for certain, just as Revelation 13 prophesied, America, the second beast, will be the nation to cause the world to take the mark of the beast - the mark of Papal Rome. So when we see news articles confirming America's lust for world dominance, it is merely confirming what we already knew from Bible prophecy. Revelation 13 tells us that it is the image of the beast that is given power to 'speak and cause' the world to worship it. This image is a uniting of church and state in America and around the world, with the church directing the affairs of the states, which is confirmed in the picture of Revelation 17, with the woman riding the beast. Now what happened in history past, when the 'church' (apostate church of Rome) took control of the state and the world? There was something that had to be removed from power first - Paganism! [or atheism]. In Daniel 11:31 we are told that the 'daily' was to be removed for the abomination of desolation to be put in place. That 'daily' is Paganism and the abomination of desolation is the Papal Church of Rome. So Paganism had to be removed for the Papacy to ascend and take control. See our page 2300 day prophecy of Daniel for more on this. Now what is the ruling power of China? Atheism! [Paganism]. So just as Paganism had to be removed from power back in the days of Rome, for the Catholic Church to take control, Paganism [atheism] needs to be removed from power of nations today in order for the image of the beast (church-state union) to take control and cause the world to take the mark. And America will be the main nation, as Revelation 13 confirms, to cause the world to take the mark, which is why America is planning war against the likes of China, in order to remove Paganism and place the 'abomination' in power (church ruling the state - Rev.17). "Turkey's Strategic Research Center for Defenders of Justice is planning to organize an 'International Islamic Union Congress' every year until 2023, to address the 'Islamic confederal state' it aims to establish across the Muslim world ... Turkey appears to be accelerating its endeavor to establish an Ottoman-style Islamic government encompassing several Muslim nations. One such effort was apparent in early November at the second 'International Islamic Union Congress,' in Istanbul. The conference is sponsored mainly by the Strategic Research Center for Defenders of Justice (ASSAM), headed by Turkish President Recep Tayyip Erdogan's chief military advisor, Adnan Tanriverdi." We are seeing the building up to the fulfillment of Daniel 11:45, which prophesies that the 'king of the north' [Turkey] will 'plant the tabernacles of his palace' in Jerusalem, the place that Erdogan and the Muslims dearly want control of. Muslims believe that Jerusalem belongs to them, not the Jews, and the tension is building all the time between Turkey and Israel, especially with the US and other countries moving their embassies to Jerusalem, and the conflict between Israel and the Palestinians. So will Erdogan get his 'Islamic confederate state'? Will he become the Islamic Caliph the Muslims are looking for to lead them? We shall see. But one thing is for certain, Daniel 11:45 will be fulfilled, as God's Word is sure! There are many in the SDA church today who teach and believe that the king of the north is the Papacy. But this does not fit at all with the context and flow of Daniel 11. So please see our page DANIEL 11 AND THE KING OF THE NORTH to see how Turkey does fit with this prophecy, and how it was also the belief of our pioneers. The fulfillment of Daniel 11:45 will be the signal that probation is about to close (Daniel 12:1). So we must be ready! We must surrender our all to Jesus Christ, so that He can live in us and make us righteous in Him. "Global investors managing $32tn issued a stark warning to governments at the UN climate summit on Monday, demanding urgent cuts in carbon emissions and the phasing out of all coal burning. Without these, the world faces a financial crash several times worse than the 2008 crisis, they said. The investors include some of the world's biggest pension funds, insurers and asset managers and marks the largest such intervention to date." Oh how interesting this is all becoming! Notice what this climate change agenda is now scaring people with? FINANCES! They are now saying that people's pockets will be hurt if something is not done about this. And what does the world cherish more than most things? Money! And their ability to continue 'buying and selling'. Now what if the pope and church leaders, together with the state, come out with a 'bold' initiative to massively help the climate and enable the people to continue 'buying and selling'. Let's say something like a SUNDAY REST LAW! I mean, what a great way, shutting down one day a week, to help reduce carbon emissions, that will curb a 'global melt-down' and enable the people of the world to continue 'buying and selling'. But those who don't go along with it, will not be able to buy and sell. Sound familiar? That's right! It's the coming mark of the beast spoken of in Revelation 13! "Revelation 13 says that America (the second beast) deceives the world "IN THE SIGHT OF THE FIRST BEAST" (the first beast being the Papacy). Take a look at the picture. Donald Trump talks about a possible government shutdown. And who is he flanked by? THREE ROMAN CATHOLIC PRIESTS. Yes, Rome has power in America. The Image of the beast is created (church-state union) and all it needs is "power to speak and cause" the world to worship the beast and take it's mark. It's coming friends!" The very power that the early settlers in America were fleeing from, THE PAPACY, is the very power that now has it's GRIP upon the American government! The Roman Catholic Church has been an enemy of God's people for thousands of years, but when she lost her power in 1798, she then had to 'tolerate' Protestantism, until she regained a position where she could influence again. But as Revelation 13 confirms, Rome will use someone else to do her final work. She will use her 'daughters', the fallen Protestant churches, who are now uniting with the state to so called 'bring God back' to America. The problem is, the 'god' which the fallen Protestant churches will bring to America, will be the god of Rome, who's 'mark' is the false Sunday sabbath, in place of God's TRUE 7th day Sabbath. The image of the beast (image of the Papacy) has already been created in America, through the uniting of the Protestant churches/leaders and the state. And one day soon, this image of the Papacy in America will 'cause the world' to take the mark! "Bickering in the Oval Office. Shouting at the Houses of Parliament. Rioting on the Champs-Elysees. It's a chaotic moment for the countries that have long underpinned the global order, a time of instability for the balance of power that has reigned for decades. Across the world, people are questioning truths they had long held to be self-evident... What's more, these events are playing out not only in the lands of Liberty, Equality and Fraternity, of the Magna Carta and of the Declaration of Independence, but across the Western world." Reading the news today is like reading straight out of prophecy! We are living in amazing times friends, and the signs of Christ's soon coming are all around for everyone to see! The scenes that gripped France during the French revolution are now being seen around the world. More and more people are getting fed up of the 'elite' world rule, and the scene is being set for 'moral' leaders to step in like the pope and other church leaders to give us a so called 'solution' to the world's problems. But as prophecy says, the pope and the fallen churches of America will lead the world into taking the mark of the beast. And so the people will be led from one deception, right into another! Just like the Jesuit inspired 'Anonymous' movement that started a number of years ago. Probation is soon to close friends! So we MUST be cleansed of all sin and be clothed with the righteousness of Christ. "Demonstrations in France by a 'Yellow Vest' group over recent weeks have dominated headlines, but similar protests, with the same symbol, have been seen in countries like Belgium, Greece, the Netherlands and in the UK." More and more people are rising up, because they are getting fed up of the way things are being run in this world. Trump was elected President of America because Americans got fed up of the 'Democratic' leaders and the way they were running things. And now we have a number of world leaders following Trump's lead. Now the interesting thing about what we are told in Revelation 13 concerning the image of the beast, is that it says the second beast (America) tells the people of the world to make an image to the first beast (the Papal Church of Rome). And what are more and more people starting to cry out for? CHANGE! And a 'new order' of things. The Jesuits are no doubt behind much of the trouble around the world, causing strife to bring about a certain result. Look at what LaFayette, a general under the command of George Washington is reputed to have said ... "It is my opinion that if the liberties of this country - the United States of America - are destroyed, it will be by the subtlety of the Roman Catholic Jesuit priests, for they are the most crafty, dangerous enemies to civil and religious liberty. They have instigated MOST of the wars of Europe." And this is where the Pope and other church and religious leaders can step in, telling the people that we need 'moral' leaders running this world, and people are getting so sick of how things are being run, that they will demand a change, and thus, the image of the beast, a uniting of church and state, with the church dictating to the state can begin to 'speak and cause' the world to take the mark - a most startling deception! This is why we must be in God's Word daily, learning from the Great Teacher Himself, our Lord and Saviour Jesus Christ, so that we will not be deceived by the final delusion coming upon this world. "Sweden's vision of a cashless society has gained traction after the Riksbank (central bank) rolled out plans to test a digital currency, the e-krona. The Riksbank's action reflects a visible undercurrent of support for the government's cashless society ambition. Sweden's march towards a heavily digitised economy was highlighted on October 1, when the global furniture giant Ikea rolled out its first cash-free retail store in Valbo. The pilot store will only accept digital payments in the form of bank cards and smartphone-based pay solutions." Over 10 years ago, when this kind of thing wasn't even being mentioned, we were proclaiming that one day the world would push for a cashless society. Why? Because we believe in the Word of God, and the prophecies of God are sure. Revelation 13 tells us that one day, no one will be able to 'buy or sell' unless they have the mark of the beast. And what needs to be put in place in order for them to stop us buying and selling? A cashless society that is run by digital currency! That day is coming soon! But the mistake that many Christians make today is in thinking a microchip or ID card is the mark of the beast. This is NOT the mark of the beast, but is the 'means' needed to enforce the mark of the beast. See our page IS THE RFID THE MARK? for reasons why a microchip CANNOT be the mark. And then see our page 666 THE MARK OF THE BEAST to see what the real mark will be. Now if you are thinking ... "Oh, this is just Sweden, as they are a bit 'out there', this won't catch on." ... Then think again! Because Amazon are looking to create 3000 cashless stores. Walmart is joining the cashless game. Australia is pushing to be cashless. We also have Africa, yes!, Africa going cashless. India is also pushing to become cashless. And many more nations are following suit. Prophecy is fulfilling and we must be ready in Jesus Christ. Are you ready to stand for God and His truth in the face of having everything taken from you? Do you have the faith to face hunger and homelessness? As this is what God's people will have to face one day very soon. So let us surrender all to Jesus now, so we can be ready in Him. "What is the position of a believing Muslim about the Palestinian cause? That Palestine in its entirety is Islamic land, and there is no difference between what was occupied in 1948 and 1967. There is no difference between this village or that village, this city or that city. All of it is Islamic waqf land that was occupied by force. The responsibility for it lies with the entire Islamic nation, and the [Palestinians] should benefit from this land. If a land is occupied or plundered, it should be liberated from the occupiers and plunderers, even if this leads to the martyrdom of tens of millions of Muslims. This is the ruling, and there is no room for discussion or concessions." We are soon going to see the fulfillment of the FINAL prophecy of Daniel 11, whereby, Turkey and the Muslims are going to 'plant the tabernacles of his palace in between the seas and the glorious holy mountain'. In other words, Turkey and the muslims are going to go to war with Israel and take control of Jerusalem, the city which Muslims believe belongs to them, not the Jews. And what does this prophecy signal? Daniel 12:1 tells us - "And at that time shall Michael stand up, the great prince which standeth for the children of thy people: and there shall be a time of trouble, such as never was since there was a nation even to that same time: and at that time thy people shall be delivered, every one that shall be found written in the book. And many of them that sleep in the dust of the earth shall awake, some to everlasting life, and some to shame and everlasting contempt." - It signals the CLOSE OF PROBATION, the TIME OF TROUBLE and the RETURN OF JESUS CHRIST. Are you ready for this? Have you surrendered ALL to Jesus? Are you DEAD to sin and ALIVE to Christ? Time is running out! Sadly, the Adventist Church today has turned away from the TRUTH concerning the king of the north in Daniel 11:45 and believe wrongly that the king of the north is the Papacy. So please read our page on DANIEL 11:45 AND THE KING OF THE NORTH for the truth! "Paris has descended into chaos as protesters rioting against rising fuel costs set the City of Lights on fire and demand a response from President Macron. More than 3000 police have flooded onto the streets of Paris as protests in the French capital turned violent ... The unrest comes after 10 days of protests and riots across France which have already left two people dead and more than 600 injured." The Lord is sending warning after warning to His people to get out of the cities. The judgments of God are to fall upon the wicked cities, and just as God told Lot and his family to flee Sodom before its destruction, and just as Jesus told the Christians to flee Jerusalem before its destruction, God, in His great mercy and love is warning us to leave the cities before His final judgments fall upon them. And even if God's judgment does not fall upon a particular city, they are so full of wickedness, violence and temptation, that we should not be dwelling in them. It is high time for us to leave for more rural, countryside dwelling places. God did not place Adam and Eve in a city. He placed them in a garden. Cities are of man, not of God. And where is the 'trumpet sound' from God's supposed 'remnant church'? Where is the warning from the church leaders? There is none! Why? Because Satan has taken control of the churches, even God's professed 'remnant church', and the leaders are keeping the people in sleep and comfort! Wake up brethren! Wake up! "Earlier, Chancellor Merkel and French President Emmanuel Macron pledged to continue supporting Franco-German efforts to strengthen a 'sovereign Europe' amid concerns that the European Union was at a 'crossroads' regarding its future role in the world. Angela Merkel has urged European Union members to give up more of their sovereignty to EU institutions ... National parliaments must play the key role in making such concessions for the greater good, she said." Satan is seeking to revive the old "holy Roman Empire", a picture of which we see in Revelation 17 with the harlot woman riding the 10 horned beast. The beast of Revelation 17 is the Roman Empire, with it's 7 heads as the 7 forms of government that Rome was ruled by, and the 10 horns, which represent the 10 'kings' or 'kingdoms' of Europe that the Roman Empire split into. This picture is also represented in the feet of Nebuchadnezzar's image in Daniel 2. But who is the woman 'riding' or more specifically CONTROLLING the beast? If you take a look at our page HERE, you will see that it is none other than that 'mother of harlots', the Roman Catholic Church. The popes of the Papal Church ruled the nations of old Europe for over a thousand years, until the 'deadly wound' was inflicted in 1798, which was prophesied in Revelation 13:3, whereby the pope was removed from his seat of power. But that wound was to be healed and the Roman Catholic Church would once again ascend into a place of power over the 'kings' of Europe. Many of the leaders of Europe today profess the Catholic faith and that 'harlot' is once again 'riding the beast', seeking to bring the world under it's power. But there is another nation - the nation that was once a place of refuge away from the persecuting power of Rome, AMERICA! But this nation, as Revelation 13 prophesied would end up 'speaking as a dragon', and causing the world to make an image of the Papal beast, a church state union, with the church ruling the state. And soon, America, along with the revived 'holy Roman Empire', will cause the world to take the mark of the beast. End time prophecy is fulfilling all around us. Please surrender your life to Jesus now, so that you will be ready in Him when the time of trouble comes. In this news video, RT News reports about the British company who are fitting microchips into their employees, and as you will see from the title of the news item in the video, they are applying this microchipping as the mark of the beast. And yes, while technology will be used to help enforce the mark of the beast, technology itself, like these microchips CANNOT be the mark of the beast itself. But this is all playing into the hands of the devil. While the Christian world and even non-Christians look to this microchip or ID card as the mark of the beast, Satan is steathily bringing in the TRUE mark of the beast, which will be the enforced SUNDAY LAW. The majority of the Christian world has already been deceived with Satan's false SUN-day rest, in place of God's true 7th day Sabbath (our Saturday). And even the world will end up accepting the enforced Sunday rest, due to this push with the climate change agenda, to 'save the planet' and 'help the family and society'. So now with the microchip being pushed in the mainstream news as the mark of the beast, even more people will be deceived into looking in the wrong place, and end up being deceived into taking the REAL mark - the Sunday law. The mark of the beast IS coming and WILL be enforced one day soon, and technology WILL be used to help enforce the mark. Just like in Venezuela and China, where they are rolling out ID cards, containing all the details of their citizens, and that can "track, reward, and punish citizens". The systems are being put in place, like the cashless society, whereby those of us who stand upon the truth in Jesus and continue to keep His 7th day Sabbath, rejecting Rome's Sunday rest, will not be able to 'buy or sell'. It's coming friends! And it's time to leave the cities for the countryside. Please see our page IS THE RFID THE MARK OF THE BEAST? 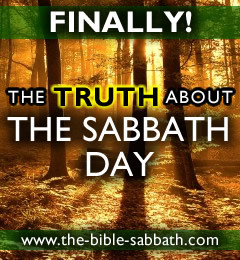 And also see our website concerning the TRUE Sabbath Day of the Lord. We must proclaim the truth about the 7th day Sabbath, so that more people will have their eyes opened and will not fall for the Sunday deception! "Scotland will become the first country in the world to embed the teaching of lesbian, gay, bisexual, transgender and intersex rights in the school curriculum, in what campaigners have described as a historic moment. State schools will be required to teach pupils about the history of LGBTI equalities and movements, as well as tackling homophobia and transphobia and exploring LGBTI identity." So as we can see, homosexuality was not just condemned in the Old Testament, it is also condemned under the new covenant. It is just as much an abomination today, as it was 4000 years ago. And those who reject the plain Word of God, are rejecting God Himself and will receive due judgment. All of us are born with a sinful nature, which is why this sinful nature needs to DIE and be 'born again' into the Spirit of Christ. This applies to those who are addicted to any kind of sin, whether it be adultery, stealing, lying, gluttony, selfishness, idolatry, AND homosexuality. Homosexuality is a sin just like all other sin and we MUST DIE to these sins and live for Christ. IT IS TIME TO HOMESCHOOL YOUR CHILDREN - State run schools are no place for your child to be educated. Please seek God's will for your child and educate your child in the ways of God, AT HOME if you can. "Dutch Sheets, one of the Trump-supporting 'apostles' and 'prophets' who have organized a series of events praying for God to create Supreme Court vacancies for President Trump and destroy his enemies, led a livestreamed prayer session for the midterm elections on Tuesday night ... with a special focus on filling the federal courts with judges who share their conservative worldview ... Sheets is a dominionist who has long taught that the church-the ekklesia-is meant to be a governing body legislating God's will on earth ... We're more than the bride. We're His government. We're His army. We're His soldiers ... We're gonna see the court continue to be transformed', said Sheets. 'Not gonna settle for a 5-4 majority. Gonna go for 6-3 and 7-2. Gonna reverse unrighteous laws. Gonna reform a nation." Where does the Bible say that the church is God's government to control the earth? The only reason Israel had a form of government the way they did, was because they chose not to have God lead them. Instead they wanted a HUMAN king to lead them. Gideon knew this was wrong when the people of Israel asked him to be their king and he replied ... "I will not rule over you, neither shall my son rule over you: the Lord shall rule over you." (Judges 8:23). The evangelicals of America today are looking to Trump as their 'king' and 'leader', rather than looking to God. Just as the Roman Catholics looked to the pope as their 'king' and 'leader' during the dark ages. And what are these Evangelicals in the US doing? They are creating the image of the Roman Catholic beast, just as Revelation 13 prophesied. Church and state coming together, with the church directing the affairs of the state. God is not leading this, Satan is! "Brazil's far-right president-elect Jair Bolsonaro has reaffirmed a plan to move his country's embassy in Israel to Jerusalem, following in the path of his political idol, President Donald Trump." So Trump opened the new US embassy in Jerusalem not so long ago, angering the Muslims. Brazil's new president now plans to do the same, which will anger the muslims even more. And we even have a move in Israel to rebuild the third temple, which if it goes ahead, will require the Muslim dome of the rock to be taken down. And what will all this cause? It will bring about the fulfillment of the Daniel 11:45 prophecy, where the king of the north, Turkey and the Muslims, will make a move to capture Jerusalem for themselves. Then the US, led by the Evangelical leaders, and it's allies will come against the king of the north to destroy him, and as Daniel 11:45 says, the king of the north [Turkey] will 'come to his end and no one will help him'. Then Armageddon will ensue! These final events are being set up right before our eyes. The 'third woe' of Revelation 11 is coming and just as the first two woes were judgments against apostate Christianity at the hands of the Muslims, it makes sense that the third woe will be of the same. So this is a warning to all apostate/fallen/fake Christians, leaders and nations. Judgment is coming! Daniel 12:1 confirms that probation will come to an end 'at the time' that Daniel 11:45 is fulfilled. So we must be ready in Jesus Christ. Our lives must be fully surrendered to Him now. Do not hold onto the world any longer. Do not hold onto your sins. Let the Lord Jesus take it all from you and make you righteous in Him. Time is running out. We do not know when our personal time of probation will come to an end. So please get ready. This world and all that is in it, will soon pass away to dust. So stop holding onto dust and start holding onto the everlasting kingdom of God. "President Trump said on Saturday that 'the hearts of all Americans are filled with grief' after a mass shooting at a Pittsburgh synagogue left at least 11 people dead, and he called on the country to combat hate crimes together. It will require all of us working together to extract the hateful poison of anti-Semitism ... Americans should stand up to 'any form of religious hatred or prejudice'." Yes, this shooting is a very hateful, wicked thing, and something that God's people would never condone! But as with all these attacks that have been happening all over the world the past few years, there is one common call that comes from them - UNITY! And who else is branded as being 'hateful'? Those of us who preach the truth and expose the plans of the state and of Babylon - the fallen churches. And thus Satan's goal of branding God's true people as 'hateful' is achieved! The above Bible verse from Galatians is so true today. Satan has created such a mindset in the leaders and people of the world to cause them to reject the truth and make those of us 'enemies' who preach it. They cannot see that we are warning them out of love, just as God is warning them (Revelation 18:4). Instead, Satan is causing them to put aside truth in favor of UNITY. And so truth will be banned one day soon, and we will be persecuted for it. But stand fast in the Lord brothers and sisters, and be make yourself ready in Christ for the soon coming final test! "Earth is on track to face devastating consequences of climate change - extreme drought, food shortages and deadly flooding - unless there's an 'unprecedented' effort made to reduce greenhouse gas emissions by 2030, a new United Nations report warns ... The stunning statistics were released Monday in a report by the United Nations Intergovernmental Panel on Climate Change, which warned that we must take 'rapid, far-reaching and unprecedented changes in all aspects of society' in order to save our planet." What did the UN say we need? 'Rapid, far-reaching and unprecedented changes in all aspects of society'. This is all part of the 2030 agenda they are pushing to gain control over our lives, 'for the sake of the planet'. And who is being lauded as a 'climate champion' and 'moral leader' for the world? The pope! So what kind of changes will the Vatican be pushing for? Sunday rest! It's coming friends! Just as God's people have been proclaiming for over 100 years. The Sunday rest law, which will be the mark of the beast, is coming! This false sabbath of Satan will be used as the answer to the problems of the world. But as we know, there is only one day that God ever 'blessed and sanctified' and that is the 7th day of the week (our Saturday). So let us follow God, not man, and keep God's TRUE SABBATH DAY. We can do nothing to save this planet as it is already marked for destruction (2 Peter 3:6-7). So what we need is to give our lives to Jesus Christ, so that when this world is destroyed, we will not be destroyed with it, and the Lord will renew this earth for us to dwell for eternity in joy and peace. "Turkish President Recep Tayyip Erdogan on Monday said that Turkey was the only country that could lead the Muslim world. 'Turkey, with its cultural wealth, accretion of history and geographical location, has hosted diverse faiths in peace for centuries, and is the only country that can lead the Muslim world', he said in a meeting with religious officials." Why do we focus a fair bit on Turkey and president Erdogan? Because there is a prophecy in Daniel 11 that gives us an indicator of when probation is about to close. Daniel 11:45 is the only verse in that chapter that has not yet been fulfilled, and it says that the 'king of the north' will 'plant the tabernacles of his palace in between the seas and the glorious holy mountain'. The 'king of the north' is the Turkish kingdom, and what is 'in between the seas and the glorious holy mountain'? Jerusalem! And as you will see from our other news articles, Erdogan and Turkey are seeking to gain control of Jerusalem for the Muslim world. Daniel 11:45 also says that the king of the north will 'come to his end' when he tries to take control of Jerusalem. And what does Daniel 12:1 say will happen 'at that time'? Michael will 'stand up', signalling the close of probation. Now some people believe the king of the north to be the Papacy. Now if you look at our page DANIEL 11 AND THE KING OF THE NORTH, then you will see why it cannot be the Papacy, but let me give you a quick reason here. Daniel 11:45 says that the king of the north will 'come to his end' BEFORE Jesus returns, whereas the Papacy (the man of sin), according to Paul, comes to his end AT the return of Christ (2 Thess. 2:8). There are other reaons why the Papacy cannot be the king of the north which you can read on our page above. The last stages of Bible prophecy is being fulfilled friends. The latter rain is falling, God's people are being sealed and the close of probation is soon to come. Please surrender all to Jesus, so that He can live in you and make you righteous (Galatians 2:20), enabling you to be ready. Time is running out! "Laudato si' is an incredible encyclical, magnificent, with a revolutionary tone, says noted environmentalist, activist, journalist and photographer. Yann Arthus-Bertrand is a committed photographer, journalist and documentary maker. He welcomes Laudato si' as a "revolutionary" text. It's a revolution that is done by recalling ethical, moral values, by practicing humanism, he told Loup Besmond de Senneville in an interview ... I see only one possible way out: the spiritual revolution ... Today, we see that there is a renewal of religions, because we're a bit lost in this materialistic world. We need basic values that are supported by Christianity ... I do not believe in God, but I am very attached to the values of Christianity." So how can someone (a humanist) who does not believe in God, see the Pope's Laudato si' as 'revolutionary', and something that the world should follow? Because that is what Laudato si' is about. It is a paper that supports the humanist way. It focuses people's attention on this planet and this life, rather than on Jesus Christ and eternity to come. And this is exactly what Satan is using to reach the world, including unbelievers. Satan is bringing the world together, to 'wonder after the beast', deceiving the world into putting truth aside and to 'come together on common ideals' to 'save the planet'. Yes, we should look after God's creation, but there is nothing we can do to 'save the planet', as it is marked for judgment and destruction (2 Peter 3:6-7). And we should not unite with the 'works of darkness' for any reason (Ephesians 5:11). But what is Satan's clever plan through the pope's Laudato si' and this climate movement? It is to bring about Rome's Sunday rest law, which the pope in his encyclical, connected Sunday rest with 'caring for the planet'. And what better way to 'help the planet' than to shut down one day a week! This is all being set up for the enforcement of the mark of the beast. Yes, we should 'shut down' one day a week. But we should observe the day God gave us, not the day Rome gave us. The TRUE Sabbath of the Lord is the 7th day Sabbath (our Saturday), not the 1st day (Sunday) - that is a mere institution and tradition of man! So let us obey our Creator, rather than follow man, and keep God's holy 7th day Sabbath. "Religious 'blue laws' achieve many of the same goals as progressive labor unions ... in an era with increasingly fewer protections for workers, progressives and religious conservatives alike should unite to push for more blue laws that protect the sanctity of life outside of of work ... These restrictions are known as 'blue laws,' and in today's climate of economic anxiety, religious conservatives and economic progressives should make common cause to restore them." Notice they call these 'blue laws' the "religious TRADITION"? That is because Sunday is NOT the Sabbath of the Lord. It is an institution of Papal Rome. The TRUE Sabbath of the Lord is the 7th day Sabbath, which is our Saturday today. This is the ONLY weekly day which God has blessed and set aside for holy use. But Satan wants his own worship, which is why he introduced a counterfeit sabbath and a counterfeit god (the trinity) through Rome. There are movements all over the world, led by the Roman Catholic Church to bring about a Sunday rest law, and as Revelation 13 tells us, it will be America, the second beast which will cause the world to worship the first beast (Papal Rome), by enforcing the Sunday rest. Yes, the blue laws have been repealed in many places, because God is patient and is waiting for us to be ready and for more people to be reached with the truth. But the time will come, when these old blue laws will spring back into force, and America will cause the world to take the mark of the beast. "As the march toward a cashless (and privacy-less) society accelerates forward, a new high watermark has been reached. India first introduced its concept for a nationwide biometric ID database more than 7 years ago, which they touted as a necessary 'social welfare' program to assist the millions of India's unbanked, streamline welfare distribution and reduce corruption ... Time and again, we have seen countries both democratic and autocratic serve as blueprints for others to follow. Given the surge in the use of biometrics for airline travel and other forms of 'elective' identification in the United States, is it really unreasonable to assume that if a country of more than 1 billion people can implement this, the U.S. population of 350 million will be protected by its own Constitution?" It is amazing at how things are moving forward today. We were saying over 10 years ago, at a time when any 'cashless society' seemed impossible, that this is what was necessary to be able to properly enforce the Sunday law mark of the beast. Many mocked at the idea, but now we are seeing it happen right before our eyes. And that is because Bible prophecy is sure ... "We have also a more sure word of prophecy; whereunto ye do well that ye take heed, as unto a light that shineth in a dark place, until the day dawn, and the day star arise in your hearts." (2 Peter 1:19). We know that there is a movement in America to change the constitution and as this news report says - If India of 1 billion people can implement this scheme, then it will be easy for the likes of America to do it. And if you have been following this news page over the years, you will have seen that even the African nations are pushing ahead with the cashless society. The fulfillment of Revelation 13 is soon to come friends. The systems are being put in place ready for the enforcement of Rome's Sunday rest law, in honor of their false trinity god. And the climate agenda is also something they are using the bring about the Sunday law. So the question is, are we ready? Have we surrendered all to Jesus Christ? Because there is a time of trouble coming for those who stand upon the truth, and we must be abiding in Christ to be able to get through the trouble coming. So the Vatican makes a deal with the government that is persecuting Protestant Christians and destroying churches. Sounds like the Vatican of old! We reported back in 2015 about the United Nations '2030 Sustainable Developement' agenda, which covers every single aspect of our lives and that would quote - "leave no one behind". And the Vatican is heavily involved in this agenda. Just look at what this 'social credit' system China is rolling out will do. As the news article above states, it will "make it hard for the discredited to take a single step." So what will happen if you speak the truth of God's Word and the three angels messages? Under this system, you would be discredited and blocked from being to do anything. Think this is just China and won't happen in America and the rest of the Western world? Think again, because steps are already in place to enforce a cashless society, digital/biometric ID systems, complete surveillance, etc. And what did Revelation 13 tell us America, the second beast, would do for the Vatican? Now these systems, ID systems and microchips are NOT the mark of the beast itself. But these systems are being put in place READY for the mark of the beast to be enforced. Which will be the Sunday rest law in honor of the false trinity god of Babylon. And with these systems in place and the world 'united for peace', those who stand upon a 'thus saith the Lord', keeping the Lord's TRUE 7th day Sabbath, and worshipping the one true God and His Son, will be persecuted and not be able to buy or sell. But stand firm in the truth friends, as there awaits an eternal life for those who are in Jesus Christ, but judgment and eternal death for those who follow the beast. "The new Italian government will introduce a ban on Sunday shopping in large commercial centres before the end of the year as it seeks to defend family traditions, Deputy Prime Minister Luigi Di Maio said on Sunday. In a bid to spur economic growth, the then Italian Prime Minister Mario Monti liberalised Sunday trading in 2012, despite pressure from the Roman Catholic Church and unions who said the country needed to keep its traditional day of rest ... Earlier this year, Poland restricted Sunday shopping as the conservative government in Warsaw pushed ahead with what it said was a return to Roman Catholic values." And that is exactly what this is - "a return to ROMAN CATHOLIC values." It has nothing to do with God, as our Creator has only ever blessed and set aside one day for rest and holy use, and that is the 7th day of the week (our Saturday), NOT Sunday. The keeping of Sunday is a Pagan tradition that was adopted by the Roman Catholic Church back in it's early days, which enabled the Pagans to enter the church also, without having to change their beliefs. And the enforced Sunday law was prophesied to happen in Revelation 13, where we are told that the mark of the beast (the mark of Papal Rome) would be enforced upon the world. The Roman Church boasts about her changing the Sabbath to Sunday, and this is in fulfillment of the antichrist 'little horn' power of Daniel 7, which would "think to change times and laws". The only time our Creator has blessed is the 7th day Sabbath. But that 'mother of harlots', the Roman Catholic Church thinks she sits in place of God and can do what she likes. But as Revelation 17 and 18 reveals, her destruction is coming one day soon. Which is why God is calling His people OUT of Babylon. Not just out of the Roman Catholic Church, but also out of all the fallen Protestant churches who are now uniting with Rome! "Breath prayer, an ancient Christian prayer practice with origins in the lives of the Desert Fathers and Mothers, is a vehicle we can use to live out Scripture's call to 'pray without ceasing' ... Breath prayer provides Christians a simple, sustainable way to gain the benefits of mindfulness while deepening our relationship with God. The practice of breath prayer considerably overlaps with the practice of mindfulness as described in the clinical psychology literature ... Studies have found that contemplative prayer, of which breath prayer is one form, can help Christians manage stress, evaluate stressors differently and increase spiritual awareness." Millions of young Christians read this magazine every month, and this 'contemplative prayer', which is all part of this Jesuit created 'spiritual formation', is being pushed right throughout the churches of the world today, and is nothing more than New Age mysticism! The devil is cleverly pushing people to seek an 'experience' through these practices, making them think it is from God. As we reported in the next news article, we are seeing 'revivals' breaking out around the world, but these revivals are based merely upon an 'experience' and 'excitement', rather than Godly repentance. And OH! will Satan give them an 'experience'! But Jesus said ... "But when ye pray, use not vain repetitions, as the heathen do: for they think that they shall be heard for their much speaking. Be not ye therefore like unto them: for your Father knoweth what things ye have need of, before ye ask him." (Matthew 6:7-8). And then Jesus teaches us the Lord's prayer, which is nothing like this 'breath prayer' or 'contemplative prayer' that these false teachers are spreading. And when Paul said to 'pray without ceasing', he was simply meaning that we should not give up asking. Just like the persistent friend who knocks on the door asking for bread (Luke 11). And the persistent woman asking the unjust judge (Luke 18). COME OUT OF HER MY PEOPLE that ye be not partakers of her sins! "There has been prevailing intercession and profound prophetic utterance released in a myriad of settings as the current generation becomes increasingly desperate for revival ... During the evening service at Mt. Carmel, as worship filled the old sanctuary, we heard a remarkable sound that seemed to reverberate throughout the entire sanctuary. I glanced up to look at Jennifer, and it was obvious that she and the minister sitting next to her had also heard the sound. It sounded as if every person in the sanctuary started simultaneously stomping their feet on the old wooden floors. I felt quickened in my spirit that it was the sound of the Lord coming upon the land ... People were crying and laughing hysterically at the same time. You could see people lying on the floor or gathering in their pews to pray with one another." What is the one marked characteristic about these so called 'revivals' in America? "Emotional excitement"! And the Spirit of the Lord never works in this way. Were the disciples falling on the floor, or laughing uncontrollably at Pentecost? No! This is not how the Spirit of the Lord moves. But it is how the spirit of the devil moves, seeking to deceive people with 'signs and wonders'. What do many of these people involved in these revivals do? They go straight back to listening to worldly music, films and TV with all manner of SIN. And as the Bible says, 'you shall know them by their fruits' (Matt.7:16). Showing that the so called 'revival' is not of God. The Holy Spirit comes from the one who is righteous. So what will we be when we are filled with the Holy Spirit? We will be righteous too. The Spirit brings the personal presence of Christ to us (John 14:18). So if we have Christ in us, then we will NOT manifest silly signs of laughing and falling on the floor. And we will not continue in sin. Instead, we will be holy in all our conduct. Please do not fall for this false revival happening! "Dominionism is the theocratic idea that regardless of theological camp, means, or timetable, God has called conservative Christians to exercise dominion over society by taking control of political and cultural institutions. The term describes a broad tendency across a wide swath of American Christianity ... When Cruz speaks of religious liberty, says John Fea, he means it as 'a code word for defending the right of Christians to continue to hold cultural authority and privilege' ... There are untold numbers of dominionist and dominionism-influenced politicians and public officials at all levels of government ... Others at the top of recent American political life have included Sarah Palin, Michele Bachmann, Rick Perry, Mike Huckabee, and Newt Gingrich. Other prominent elected officials in the dominionist camp include ... Gov. Sam Brownback." This secular research article is from 2016, but reveals amazing information regarding the image of the beast that has been formed in America. We were told in Revelation 13 that America would form an 'image' to the Papal church of Rome (first beast). And what is the Papacy? It is a uniting of church and state, with the church having authority over and directing the affairs of the state. This is exactly what these dominionist "Christians" in America are seeking. To gain complete control! And what does this article confirm? It confirms what we have been saying for a long time, that this 'religious liberty' movement is a 'cloak' for the church to hold 'authority' over the people. And the only people who will benefit from this so called religious liberty are those who join in with the fallen churches of Babylon in this ecumenical movement. And yet the masses are blind to this trap! Lord have mercy on us! Will Trump continue to hold the presidency? We don't know. Whether he does or doesn't matters not, because Satan has already put the system in place (the image of the beast), so that whoever is in the 'hot seat' will be directed by these 'Christian dominionists'. The next step is for this 'church-state' image to be given power to 'speak and cause' the world to take the mark of Rome - the enforced Sunday law in honor of their false trinity god. "Pope Francis met with the International Catholic Legislators Network (ICLN) during their 9th annual conference, telling them that their position as Christian's with authoritative roles is to spread laws based on the teachings of the Church in order to aid Christians and other religious minorities who are being persecuted worldwide." We have been saying for some time now that this 'religious freedom' movement among the churches of Babylon is completely fake, and that the main motive behind the movement is for religious laws to be enforced that will protect those who join in with this ecumenical movement. Satan is behind this ecumenical, 'religious freedom' movement, to unite the churches and religions in controlling the state powers, to enforce religious laws. Now what is fundamental teaching of the Roman Catholic Church? "The mystery of the Trinity is the central doctrine of the Catholic Faith. Upon it are based all the other teachings of the church." (Handbook for Today's Catholic, p. 11). So what is the false Sunday sabbath of Rome based upon? The false trinity god! What 'god' do many other religions worship? A triune god! And what is the day of this triune god? SUN-day! The day that Rome wants enforced as a day of rest all around the world - the day of their 'trinity' sun god. And what teachings of Rome have most of the fallen churches of Babylon been deceived into following? The 'trinity god' and 'Sunday sacredness'. And the Papacy wants these teachings enforced BY LAW! This will be the MARK OF THE BEAST. "Jacksonville City Councilman Reggie Gaffney ... told CBN News ... I think the faith community has sat back too long and allowed others to dictate what's going to happen in America. I just want to see the churches, all these pastors that I know and the leaders in this community say, 'enough is enough,' and mandate ... I think this is why you see America's now falling apart because nobody wants to talk about the real solution and that's bringing God back in everything we do ... Gaffney is set to host a meeting with faith leaders from the community this Friday." So if the "faith community has sat back too long and allowed others to dictate what's going to happen in America. ", then what does that mean the faith leaders are now being called to do? For them to dictate what happens in America! And do you know what that is called? The image of the beast, just as Revelation 13 prophesied would be created in the USA. And what happens in the US, will be copied around the world! We were saying years ago that Satan would probably create such problems in the US and the world, as to cause the Evangelicals and Catholics to rise up and take control of government, so they can 'dictate' what happens. And in 'bringing God back into everything they do', what is that going to cause? Well, what 'god' do the Evangelicals and Catholics worship? The false trinity god. And what day do they keep as Sabbath? The false Sunday sabbath. So for them to 'bring God back into everything', will result in the prophesied enforcement of the mark of the beast, which will be the Sunday law, in honor of their false trinity god. "The radical Islamist organization Hizb ut-Tahrir (the Islamic Liberation Party), which operates in Israel and in the Palestinian Authority-assigned areas of Judea and Samaria, continues to preach for the establishment of an Islamic caliphate with Jerusalem as its capital ... In his speech, Abu Arqoub turned directly to the armies of Egypt, Jordan, Saudi Arabia and Turkey and asked them to fight the 'allies of Satan', a reference to the United States." There is one perticular leader who has placed himself into a position to become the next Islamic Caliph, and that is President Erdogan of Turkey, the king of the north spoken of in Daniel 11:45. If you study Daniel 11:45, you will see that Turkey and the Muslims are going to capture Jerusalem for themselves, with Erdogan and Turkey placed as the main force behind this. But there is another prophecy to be fulfilled, and that is the 'third woe' of Revelation 11. The first two woes, the fifth and sixth trumpets of Revelation were fulfilled by Islam and were judgments against apostate Christianity ... "the Saracens and the Turks were the instruments by which a false religion became the scourge of an apostate church ... The hordes of Saracens and Turks were let loose as a scourge and punishment upon apostate Christendom." (Uriah Smith, Daniel and the Revelation, 1897, p.495 + p.517). So it is very likely that the 'third woe' will be the same - judgment upon apostate Christianity. And who is the main target for the Muslims today? America! Please see our Battle of Armageddon page for more information on that great battle that is to come. "I suggest that the key to Chick-fil-A's success is the company's foundational habit of being closed on Sunday. By focusing on the care of their employees and their families through a company-wide day of rest on Sunday, Chick-fil-A saw a cascade of benefits that then drove the company to act even further. From the Sabbath, the company went on to start providing scholarships to seasonal employees, caring more about food quality, customer service and even about the care of the chickens they eventually serve to customers. Every Chick-fil-A is closed every Sunday and this foundational or keystone habit has turned into a key advantage over its rivals. Chick-fil-A did $9 billion in revenue last year and the average Chick-fil-A did four times the revenue of the average KFC, which is open every day. They consistently have the best customer service rankings, highest cleanliness scores and most engaged employees. The Sabbath has transformed Chick-fil-A into a powerhouse." The 'Sabbath' they speak of, is of course not the Biblical Sabbath. It is man's unholy replacement for God's holy 7th day Sabbath. But can you see what Satan is doing here? He is bringing about success to a company that closes on Sunday for rest. Expect to see more of this, as Satan uplifts Sunday. And as Revelation 13 tells us, Rome's mark (Sunday rest law) will be enforced upon the world by America. "Evangelical Christians in the United States are having a direct influence on the decision making of President Donald Trump. That's the claim being made by Johnnie Moore - the man who put together Trumps evangelical advisory body. Speaking to Premier, Moore said you can see the impact being made. This administration has not only continued to ask for our advice but they have frequently acted upon our advice." SEE ALSO: Christian leader Dutch Sheets says "It's time to shift the courts!" This is the 'image to the beast' spoken of in Revelation 13. God told us in Revelation 13 that America (second beast) would make an 'image' to the first beast (the Papal Church of Rome) - a uniting of church and state, with the church directing the state. We now see that the image has been created. The fallen Protestant/Evangelical churches, along with the Roman Catholics, have united with the state in America to enforce the dogmas of Rome. All this image needs now is 'power' to deceive and cause the world to take the mark of Papal Rome (the coming Sunday law, in honor of the false trinity god of the fallen churches of Babylon). Please Mark the following words well. Please don't be deceived by these fallen churches. They have turned away from the one true God and His Son. They have lost the power of God and are now seeking power from the state. And this will only result in evil. God's true people are not those who follow the churches and leaders. They are those who 'follow the Lamb wheresoever He goeth' (Rev.14:4). Please follow the Lord Jesus and Him alone, and you will be safe. "Canada's two largest churches, which represent two-thirds of Canadian Christians, have jointly declared that climate change and ecological degradation are central, enduring concerns for Christians. The declaration is contained in 'The Hope Within Us,' a document released July 23 from the official Roman Catholic-United Church of Canada dialogue ... The ecumenical document marks 40 years of dialogue between the churches. The 22-page statement draws heavily on Pope Francis 2015 encyclical Laudato Si' ... Early Church theologians saw the interrelationship of the Trinity through the dynamic life of creation itself." What is the one thing that all these churches who are uniting together concerning climate change are pointing to? The pope's climate encyclical! And so the world 'wonders after the beast', just as we were told in Revelation 13. And what did the pope link caring for the planet with in his encyclical? Sunday rest! And so as the cry of this climate change agenda rises, the call for Sunday rest will be heard more and more, and the churches, who are uniting with the state will demand that the state enforce a Sunday law to 'help the planet', and to appease their false trinity god. Please see the truth about the Sabbath and the false trinity god, as this will help you not to be deceived by Rome and the fallen churches of Babylon. God is calling - COME OUT OF HER MY PEOPLE! "About 8,000 official and unofficial churches, as well as 100 mosques, have been closed in Rwanda for failing to comply with health, safety, and noise regulations ... And authorities indicate such shutting down of houses of worship in the East African nation will continue until congregations meet the strict requirements of a new law adopted by Rwanda's parliament on July 27. The latest requirement: Pastors must now have a degree in theological education from an accredited school." Don't be surprised to see this kind of law spreading around the world. Russia has already banned any church which hasn't had approval from the government, like the Jehovah's Witnesses. And with 'extremism' being closely watched around the world today, it would not take much for governments of other nations to start banning churches and pastors who are not 'accredited' through the world's system. Satan wants to stop the truth going forward, and instead of just outright banning those of us who preach the truth, he is using very clever tactics to get at us. But the latter rain and loud cry is going to happen, and is already happening, and there is nothing Satan or the world can do to stop it. The question is, will you be part of it? Only by complete surrender of our life to Jesus, can we be part of the latter rain and loud cry. There are so many things happening in this world today of which we have never seen before. Major events that are taking place more and more frequently and with more intensity. There is no doubt we are living in the end times, and these news items only further prove where we are in history. Friends, it's time to BE READY! It may be a few years, it may be ten years. All we know is that Jesus is soon to return and we need to heed the warning signs and be ready. For older end time news articles, please see the following links where you will find archived news.